An ideal fitness belt for everyone! 2bFIT is proud to provide you a workout belt that is an ideal addition to your fitness life. Whether you’re running, cycling, going to a gym, travelling, working out or simply going for a walk, it will make your experience more comfortable and enjoyable. With four built-in pockets (2 in the front, 2 at the back), you can carry a number of accessories stored away safely and easily accessible on the go. Put on your headphones, hide your phone or a music player in one of the pockets, and enjoy your time. Any other essentials you wish to take with you, such as credit cards, money or medications will fit safely in the belt. If you want to keep your items most secure, simply flip the belt inwards and they will fit firmly around your waist during exercise. The belt is fitted with a sturdy key hook. Attach your keys to keep them safe and easily accessible when required. Made from high quality spandex-lycra blend, the 2bFIT fitness belt is very lightweight, elegant looking and does not cause allergies. It grips firmly to your body for a stable hold and adjusts on the go thanks to its stretchable properties. 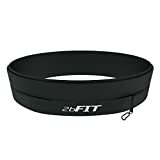 2bFIT workout belt is an ideal solution for everyone. No more worries about losing your things, it stays firmly on your body and can be even worn under clothes, where it won’t be visible due to its lightweight and sleek build. So, buckle up and enjoy your training!